i haven't seen as great 256b intro ever. congrats d.ment! This is trully the best 256b I ever saw. By far. Cool voxel fractals, kinda slow lika hell..
What is it? A Julian Set or something? looks very nice, but at 10 fps I don't give a rulez. I get about 5 fps, but this truely rulez! wwaaaaahhh amazing i just can't belive it! I wonder why I didn't know about this before (popularity 1%, wtf). I guess this should have been released four years later to get all the credit it deserves :). Beautiful. Oh my goodness! High(ish) resolution, great colors, morphing julia set as elevation map, and julia clouds! In 256 bytes! Or for speed, 236 bytes! Visually impressive, but it's too slow and seems to underline what cannot be achieved in 256b rather than what can, so I guess I miss the point. nice colors, great idea, perfect. only the speed (<1fps @ 1.4 ghz), but that is not such important. Wow, very cool code and beatiful colors! The beauty of mathematics in 256 bytes. Oo where's my thumb ? How is this possible? It's the most impressive thing I've ever seen. Either I'm incredibly lame, or this is incredibly incredible! WTF! 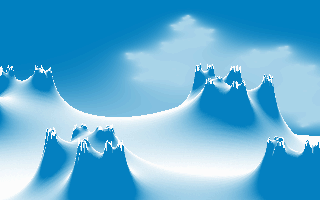 That fractal looks like a mountain covered with snow. Woah. Slow as hell, but still awesome. A little slow - but for this category; stunning. I love the snowy palette too! Certainly one of the best looking 256b intros to date. AWESOME! Now that's what I call code! I don't think so, anes. There is no big difference when I ran it on my old Celeron 433MHz and when I run it now on my new P4 3GHz. And why here isn't my comment? Legendary intro, fractals rule forever. A decent take on fractal geometry, if a bit too obvious. page created in 0.020971 seconds with 15 queries.